“We heard you and we’re going to implement the law that you voted for,” Hoffman said in his first public press conference since being appointed chairman of the Massachusetts Cannabis Control Commission last week. 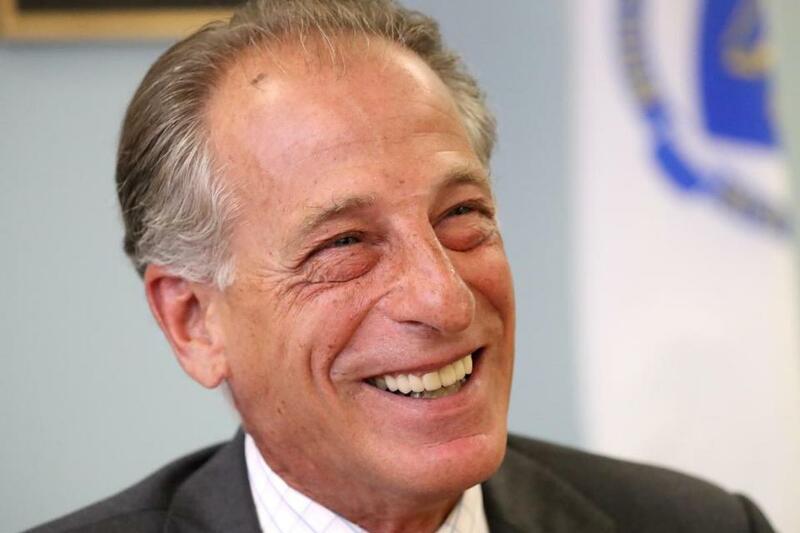 When career business executive Steve Hoffman was appointed the state’s marijuana czar last week, pot proponents reacted with immediate skepticism. Here was a 64-year-old suit who once worked for Mitt Romney at Bain & Co., had no cannabis industry experience, and had voted against legalizing the drug. But Hoffman, it turns out, isn’t quite the caricature of a corporate stiff they imagined. In his first public comments since becoming chair of the new Massachusetts Cannabis Control Commission, Hoffman on Wednesday said that he believes marijuana isn’t harmful, that the country’s prohibitionist drug policies have failed, and that he’s committed to creating a thriving recreational sector. And he got high on legal pot in Colorado last year. The T-shirt, he said later Wednesday, depicted a molecule of THC, the primary psychoactive ingredient in marijuana. “I thought it looked cool,” he shrugged. The remarks — along with Hoffman’s easygoing but determined demeanor — should help soothe the angst of the many voters, advocates, and cannabis entrepreneurs who are upset that state officials have delayed implementation of the Question 4 ballot initiative that legalized marijuana. Romano said he was particularly struck by Hoffman’s remark that he would run the cannabis commission like a “big startup” company. “That indicated to me that he wants to get the revenue that’s available to the state, and isn’t trying to obstruct the program as a whole,” Romano said. Last year, state legislators pushed back the measure’s January 2018 start date for recreational sales by six months to July 2018. Then, lawmakers missed their own deadline for making other changes to the law by several weeks. So the revelation last week that four of the five new cannabis commissioners, including Hoffman, had voted against Question 4 prompted exasperated marijuana proponents to brace for another setback. They feared a state marijuana agency dominated by opponents of legalization heralded what the advocates consider stonewalling and overly restrictive rules. Hoffman sought to quash such talk Wednesday, saying he was confident his agency would succeed in its race to find office space, hire staff and enforcement officers, write regulations, and process license applications by July. The commission, which will have expansive authority to set the rules of the marijuana industry, is tentatively scheduled to hold its first public meeting Tuesday. Hoffman, who will be paid $160,000 a year, said he opposed the ballot measure only because he thought its timeline was too aggressive. “I thought a slower and more studious approach would be better,” Hoffman said, laughing and acknowledging that it is “amazingly ironic” he is now responsible for meeting that timeline. Hoffman pledged support for the goals of Question 4: generating tax revenue for the state, eliminating the black market for pot, preventing youth access, and mitigating the cost of the US “war on drugs,” which he said fell disproportionately on communities of color. He may face a skeptical audience in leaders at the municipal level, however, as many have pushed for more powers to ban or sharply limit recreational dispensaries. Another obstacle: The Cannabis Control Commission, currently using temporary office space near the State House, has just $2 million in state funding. That’s far short of the $10 million that state Treasurer Deborah Goldberg has estimated it will need. Hoffman agreed his agency is likely to ask the Legislature for more money, and pledged the commission would operate transparently. Hoffman said he smoked marijuana in the 1960s and ’70s when the drug was “ubiquitous” at his high school and college, but rarely imbibed after embarking on a business career that saw him make partner at the prestigious Bain & Co. consultancy. He eventually headed the firm’s Boston office and reported directly to Mitt Romney when the future governor was tapped in 1990 to lead Bain & Co. out of a financial crisis. He said the problems that led to the crisis were exacerbated by senior managers keeping too much information from other employees.